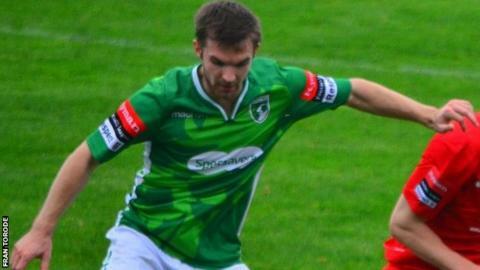 Midfielder Matt Loaring believes lack of competition for places could be to blame for Guernsey FC's poor form. The Green Lions have lost eight of their last 10 games in the Isthmian League Division One South. "A lot of the time Tony (Vance) and Fal (Colin Fallaize) have had a set team for every game. "They know they're only going to have 12 or 13 people, especially for some of the midweek away games, which hasn't helped," Loaring told BBC Guernsey. "Having that competition back will be good and get everyone motivated and lead to some good performances." Guernsey, who are just four points above the relegation places, face a trip to mid-table Whitstable Town on Saturday. "I think we're strong enough to compete at this level. The teams we face are looking quite strong this year, and from playing them last year some of them are looking like quite good sides," Loaring added. "Being stuck in the same league hasn't helped us this season, teams know how we like to play and they've come up against us this season with a bit more knowledge about how to beat us."